On March 8, 12 – 1 p.m., Virginia Main Street is offering a free webinar focused on how to promote buying local and practical ways to build a resilient economy in your community. Local isn’t just a place on a map. It’s people: your neighbors and their families, their businesses, farms, nonprofits, events, and recreational venues. Local is a community and all of the opportunities we create together and challenges we work to overcome. Local First has a passion for people living and working together in sustainable community. That’s Local First’s mission, a western Michigan advocacy organization, leader of a fast-growing movement, and the root of this webinar’s message. 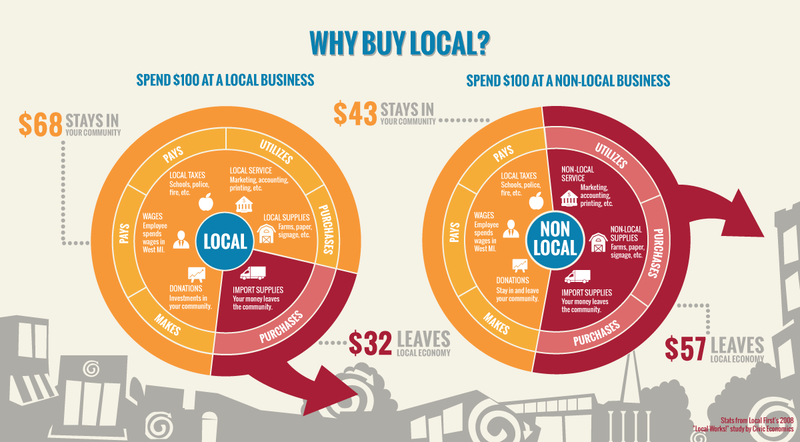 By choosing local and independent businesses for your services, shopping, dining, and other needs, you not only enjoy a more distinctive and personal experience, you’re strengthening your local economy. Elissa Hillary is committed to building sustainable local economies that put people first. As the President of Local First since 2007, she has brought together nearly 1,000 businesses in West Michigan to collaborate in building a vibrant community that encourages sustainable business and social enterprise development. As a consultant and speaker, she magnifies that impact in communities around the world. Elissa is a founding Business Alliance for Local Living Economies (BALLE) Fellow, the 2014 BCorp Measure What Matters Champion, and a BCorp Ambassador.